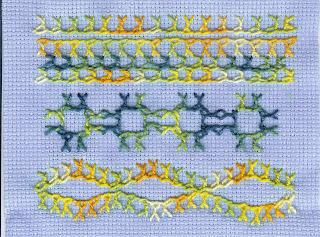 Here's my TAST sampler for Bonnet Stitch. This one was unknown to me but once again I really liked the patterns I could make. Once I'd worked out how to do it I was able to get into a rhythm and it went quickly. This looks fantastic Lynne--I'm battling with this weeks stitch can't make head nor tale of it..might miss this one.